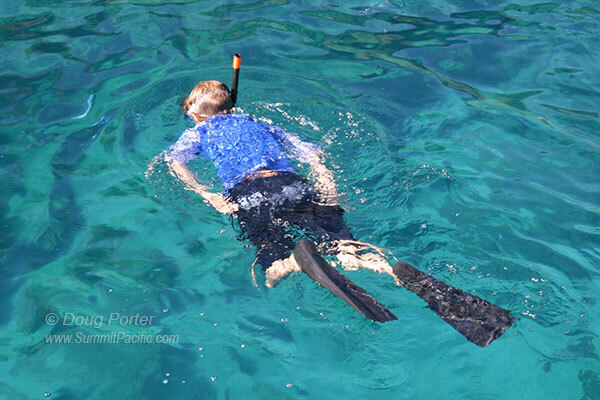 Snorkeling on Kauai is lots of fun and easy to do. Several professional guides are available that can provide you equipment and show you the best snorkel and scuba diving spots on Kauai. Or, if you have your own equipment and are comfortable in the water, a variety of fish and sights await you just below the surface all around the island. Because of Hawaii's geographic remoteness, many of the fish you'll see aren't found anywhere else in the world. Like all water sports, ocean snorkeling carries with it inherent risks and requires a certain level of fitness and swimming skills to participate. If you are a beginner, please consider going with a guide that has experience. Check locale conditions before entering the water, and spend a certain amount of time on the shore observing conditions and water currents before entering the water. Always go with a buddy and please use good environmental practices on coral reefs. Anini Beach is protected from wave action by the largest reef on Kauai. The relatively calm and shallow water here provides a great snorkeling, especially for beginners. Located off of Kalihiwai Road, on Kauai's north shore, Anini also provides a large public park with picnic benches, and fresh water. Beware of strong currents during periods of high surf. The beach is also a good location for seashell collecting. Ke'e Beach is located at the very end of the road on Kauai's north shore past Haena Beach Park. The reef offers good swimming and snorkeling during summer months and calm seas, but it is very important to stay inside the reef and be aware of strong currents which tend to pull you around the corner towards the Na Pali Coast. Snorkelers can see a wide variety of fish and sea turtles. Tunnels Beach is for the more experienced snorkelers and scuba divers. Located near the YMCA camp between Hanalei and Haena on Kauai's north shore, "Tunnels" gets its name from a labyrinth of underwater lava tubes, canyons, and pathways that support a wide variety of colorful sea life. The shallow reef is protected by an even larger reef further out. Although no facilities are located here, the beach is spectacular and very picturesque. Lydgate Beach Park is located on Kauai's east shore between Lihue and Wailua. Follow highway 56 to Leho Drive near mile marker 5. Lydgate is perhaps the best Kauai snorkeling spot for children and beginners. It is protected by a small lagoon that is enclosed by a man made rock wall. You can see a surprising number of fish here including colorful parrotfish. The park also features a playground. Moloa'a Beach has a few good snorkeling spots in the bay and are quite fun if the ocean is calm. It's best not to enter the water during high surf because strong currents can develop and it's easy to be pulled out to sea or pummeled into the shallow reefs in the bay. Take a few minutes to observe conditions and if waves are breaking over the reef don't go in the water. Larsen's Beach has some great snorkeling spots in the deeper channels that run through the reef. The water is very clear with lots of fish, coral, and an interesting underwater topography. Especially if you stay to the right (southeast) end of the beach. There is a rip tide that pulls water northwest across the reef draining into Pakala Channel where the long beach is interrupted by the outcropping of black lava rock (seen in the picture above). Avoid getting in or near this channel as the current is very strong here, flushing everything out to deeper water or across the sharp reef. Of course there are no life guards. Poipu Beach has been ranked as one of America's best beaches and is undoubtedly one of Hawaii's favorites. There is something for everyone here including swimming, body surfing, a shallow protected area for children, and good snorkeling to the west of the tombolo (narrow strip of sand running out to Nakumoi Point). Poipu Beach Park includes fresh water showers and a playground. A restaurant and convenience store are also right across the street. Prince Kuhio Beach The bay across from Prince Kuhio Park is a great spot to see Hawaiian Green Sea Turtles, also know by their Hawaiian name Honu. Park along the street in front of the park and use the small beach to the east of Kuhio Shores. During high surf, the tide tends to pull you west along the front of the seawall. If this happens stay calm and exit the water past the sea wall being careful not to step on any sea urchins which have sharp spines that can puncture your skin and break off. Although not life threatening, it is very painful. Salt Pond Beach is located near Hanapepe and is a nice crescent shaped cove that is protected from wave action by an offshore reef. There is a good place to snorkel around the rock outcropping by the salt ponds with a wide variety of marine life to see. However, avoid swimming or snorkeling here if the surf is high. From Hanapepe, travel 1/2 mile on highway 543 to Loloka Rd. See this Kauai Map for more information.